A food allergy dad got the ball rolling with a phone call and one request: could Northwestern consider having a nut-free game so that his son could attend a game? Northwestern decided to not only grant this one request, but to do something that hasn’t been attempted by a college athletics program to date: go peanut and tree nut free for many games in multiple sports during the year, offering students and fans with nut allergies plenty of opportunities to attend a game and cheer on the Wildcats. 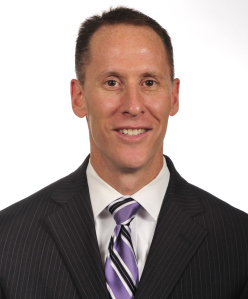 To learn more about what it took to go nut-free at Northwestern, FARE interviewed Mike Polisky, Deputy Director of Athletics – External Affairs at Northwestern Athletics. Download this flyer to view the game schedule..
1. Why did Northwestern decide to go “all in” this season?